Water, the most basic and life giving substance on the planet. Without it, nothing would be alive. From the smallest organism to the largest behemoth. So it’s not surprising that our skin is at its best when we are fully hydrated. You lose a lot of fluid through sweating and other excretory processes which will leave your skin looking dull and aged. Water flushes toxins out of vital organs, carries nutrients to your cells, and provides a moist environment for ear, nose and throat tissues. Drinking enough water is very healthy habit. Many people don’t like drinking plain water and instead have the habit of drinking coke, coffee, cordial or any other carbonated, caffeinated sugary water. They think that by this way they can compensate for not drinking enough water. Is that right? No it’s absolutely wrong! Your body needs enough water. 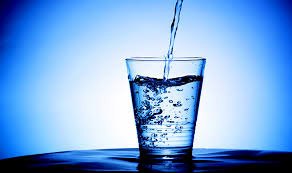 Water that is alkaline and fresh is the best water to drink to keep your cells healthy. 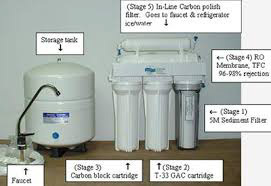 You can buy special filters that alkalize and remove chlorine and fluoride. Do not ignore water if other drinks are available. Water re-hydrates your system and make sure that you look beautiful with a glowing complexion. The bonus point is it makes you healthy as well and keeps your body and skin free from toxins. 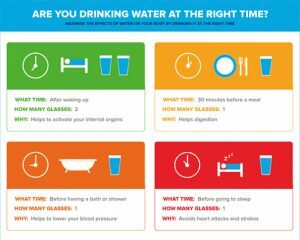 You hear many different theories on what is the correct amount of fluids, and which fluids are the best to keep you fully hydrated. Let me quickly set the record straight. 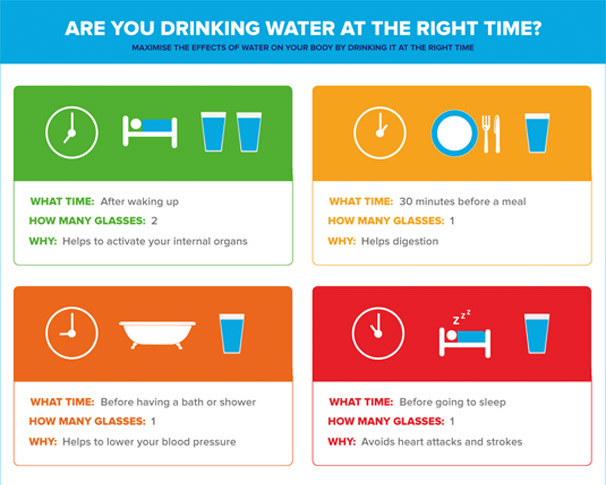 The amount of water your body needs varies depending on many factors. Your gender, where you live/climate, your life style, how healthy you are or if you are pregnant or breast feeding. *A pretty good indication of whether or not you consume enough water is if you urinate around 1 & 1/2 litres of liquid a day and it is a pale yellow to clear colour. If you are thirsty, you are dehydrated. Simple. Around 3 litres for males and 2.2 litres for women, again, depending on your circumstances (more if you exercise). *Although uncommon, it is possible to drink too much water. When your kidneys are unable to excrete the excess water, the electrolyte (mineral) content of the blood is diluted, resulting in low sodium levels in the blood, a condition called hyponatremia. Alkaline water and herbal teas are the best source of hydration although *what you eat also provides a significant portion of your fluid needs. 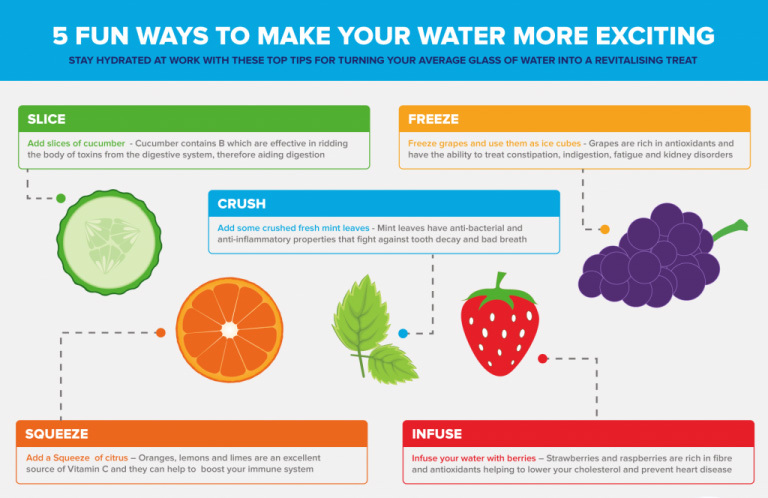 On average, food provides about 20 percent of total water intake. For example, many fruits and vegetables, such as watermelon and spinach, are 90 percent or more water by weight. Beauty benefits of drinking water. Diminishes wrinkles: Drinking more water restore elasticity of your skin and therefore it helps in reducing wrinkles and even prevents new wrinkles from occurring. Drinking enough water ensures the skin is hydrated from the inside and out, which results into preventing dry and chipped skin. Thus eventually it keeps your skin radiant, even toned and supple. Consuming the correct amount of water helps in flushing out toxins from your system and can help cure acne. Drinking more water lessens dehydration and therefore helps in reducing the dark circles and bloodshot eyes. It will also give you sparkly and clearer eyes. It also helps in losing extra weight. The reason for this is that by drinking enough water you improves your metabolism leading to improved digestion.